We adore couples that add a little twist to the traditional when it comes to their wedding day design. Rick and Sara totally nailed the combination of feminine elegance with that little added cool factor. 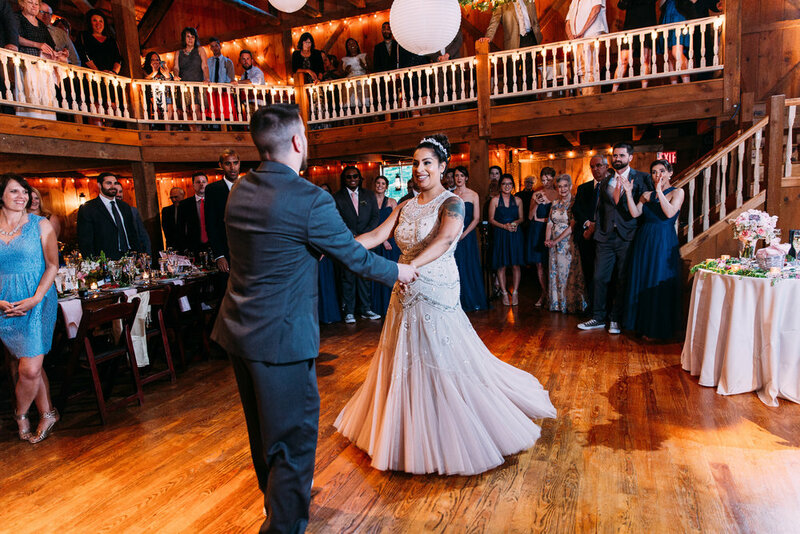 It was the first wedding of the 2017 season, and WOW did they knock it out of the park. The bride Sara planned every last detail down to the names of her signature cocktails. You will see how she contrasted antique blush tones with metals, blues, and grays, for a truly a stunning combination. And lets not forget the Mother of the Bride in this wedding, seriously how gorgeous is she in that full length beaded gown? She is proof that brides don't have to be the only stylish lady at a wedding. 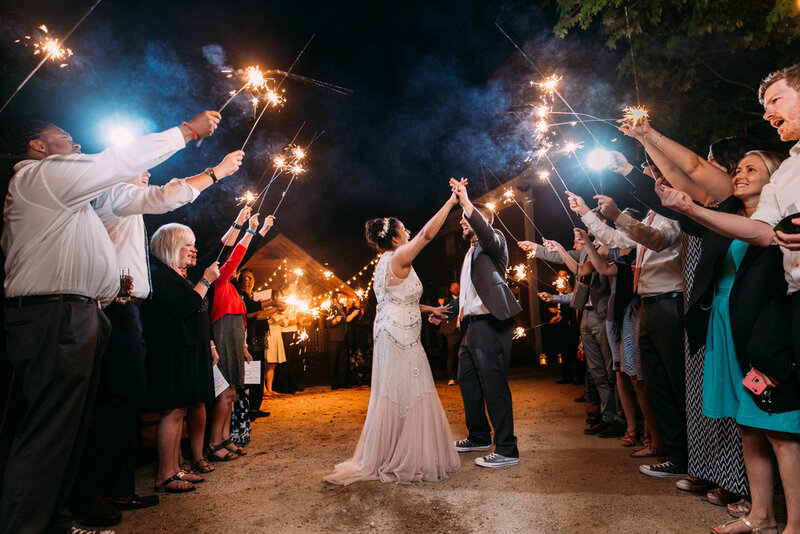 We took the time to interview the bride about a few details of the weekend, here is what she had to say....we love her advice to future couples! Your wedding was visually stunning, if you had to describe your wedding day style/look in a few short sentences what would it be? When I found the dress, a year before the wedding, it inspired my vision for the wedding. The tulle wedding dress was ivory on the top with a high neckline and intricate beading in ivory and silver throughout, the bottom of the dress progressed to an antique blush. We wanted the wedding to feel warm, whimsical and romantic , our color palette was ivory, green, metals, and blush, since my dress was blush the groomsmen wore blush ties with their grey suits, the bridesmaids wore convertible soft tulle blue dresses made by jennyyoo which made my dress stand out and they had blush and ivory florals. 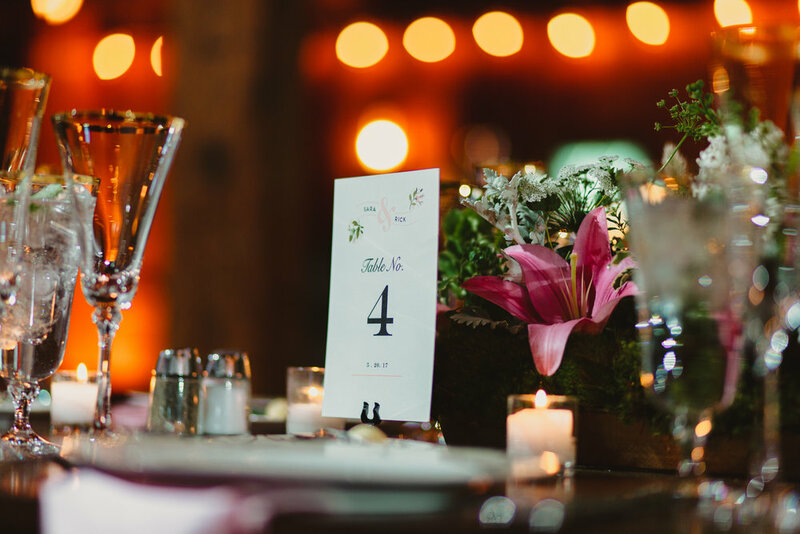 The flowers really showcased the whimsical vibe I envisioned, and the lighting made it very romantic, we also wanted personal touches and style everywhere. 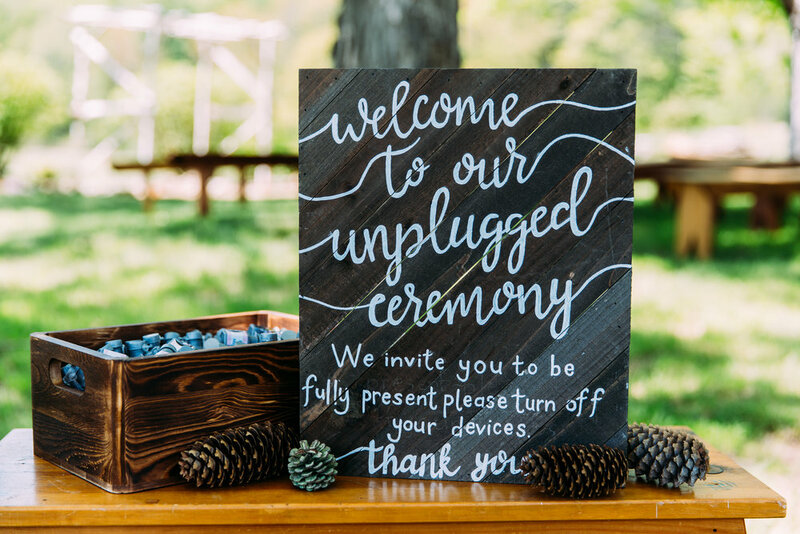 We had custom signage everywhere, signature drinks named after our pups, and custom sneakers for the groomsmen, the font we chose was a mix of cursive and more casual font to blend everything together. What did you love most about being married in the Spring? We met in the spring, so getting married during that time of year just felt right. Rick's family is from Northern California and he grew up in the mountains, we were really grateful to have the scenic mountain views in New Hampshire. We loved that this was a destination wedding for everyone, and that we could all spend the weekend together. It completed the feeling of togetherness and warmth that we wanted to feel during our wedding. Do you have any planning advice for future couples that are recently engaged? Stay true to what you envision and do not compromise just because it may not be the easiest or most traditional route. It is your wedding and you both should be happy and have it represent you as a couple. Having a long weekend away was amazing but it did add more work for me as the bride since I had to figure out where everyone would be sleeping and where I wanted everyone to get ready etc. but it was really worth it for the experience that we got to have with our families, plus the ease of having everyone on site was amazing. We are both very creative people, so it was important for me to find vendors that got our unique style and vision but to also to let them do what they do best and not to micromanage them. I think this made them more excited about our wedding because we collaborated and they could be creative too. The flowers turned out way better than I could have imagined, and I think that freedom was a big contributor to the final look. Another huge piece of advice is to be in the moment and let go of all of the planning once the wedding is upon you, you planned everything to the best of your ability, you got the vendors that you love, so it is time to trust them and have fun! Looking back on your wedding weekend what moment and or moments stick out in your mind? There are really so many. When couples ask us what moment we appreciate the most, Rick and I agree. The Preserve is such a unique venue, there is so much character inside and outside the Inn. One place in particular was a bar in the inn, that is so special. I arranged with the caterer to have signature drinks and every hors'devours waiting at the bar in the inn for just the two of us right after the ceremony. I asked our bridal party to lead every guest to our cocktail party while we shared the intimate moment alone as a just married couple. 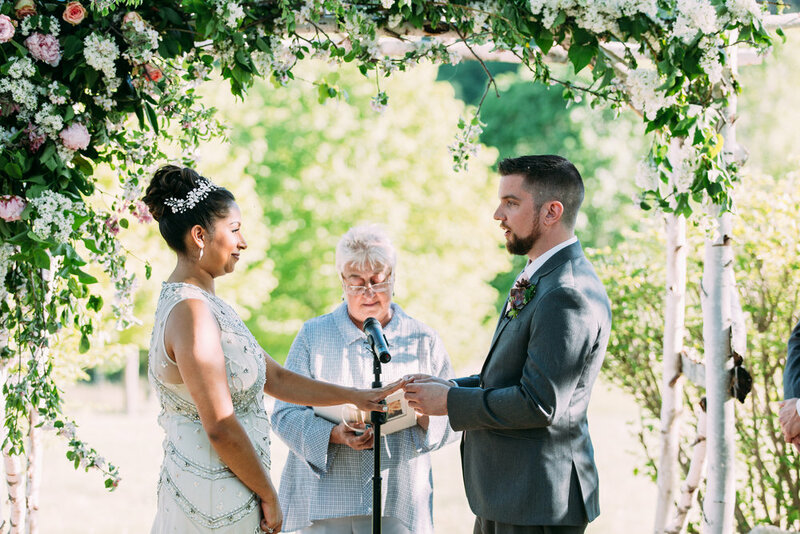 We were able to talk about the ceremony and share in the special feeling of being married now. It was really special and important because after that we were talking with our friends and families for the rest of the night. For the full gallery click here. And check out the incredible vendor team that made their dream day a reality.